This is going to be a very long post so I have decided to split it into 2 parts. Part 1 will talk more about Bazi Profiling whereas Part 2 will reveal what 2011 holds for you plus valuable info on good date selection. 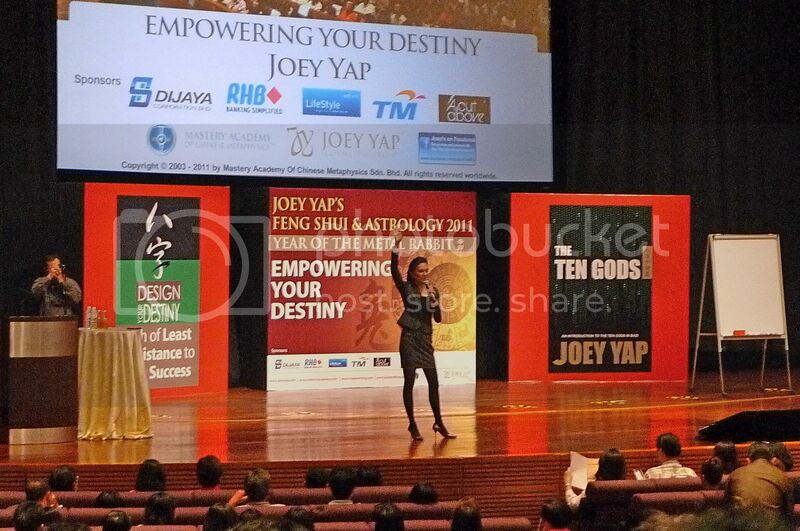 I attended both Lillian Too and Joey Yap's Feng Shui talks this year. But really, I am not obsessed with feng shui. I simply find this very subject of wind and water very, very interesting! If you are not into feng shui, you really have to ask yourself why. Because feng shui works regardless of your beliefs. It is powerful and I do know that people who understand feng shui and practise it do indeed have the upper hand compared to those who don't. 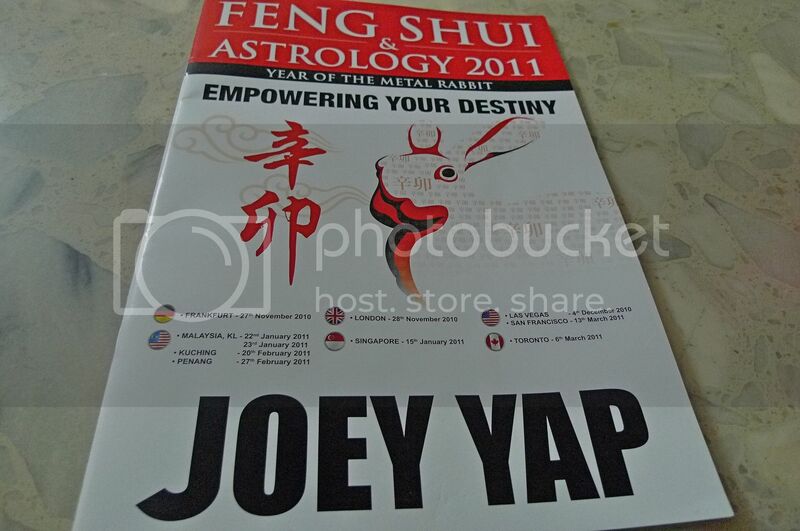 I have already blogged about Lillian Too's Feng Shui Extravaganza 2011, so it's time for Joey Yap's Feng Shui & Astrology 2011! Take note that all the information provided on this post will take effect from February 4th 2011. That day is the starting of spring or Li Chun according to the Chinese Solar Calendar. Incidentally, this year's Chinese New Year, which is really the first day of the Chinese Lunar Calendar, is on February 3rd, just one day before Li Chun. As today is just a few more days to February 4th, you can see why I need to rush this post out to benefit all my readers! 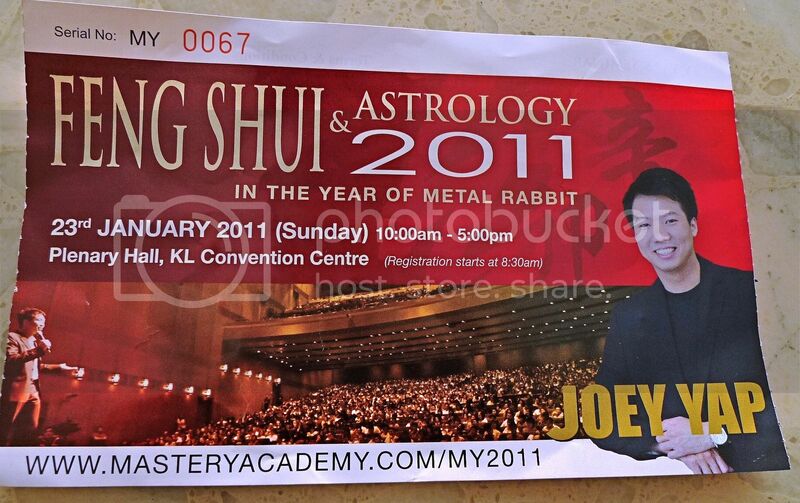 I attended Joey's English seminar entitled "Empowering Your Destiny" on January 23rd 2011 at Plenary Hall, KL Convention Centre. He had a similar seminar in Cantonese just the day before. Compared to Lillian Too, I must say Joey's seminar was done in a much more professional way! 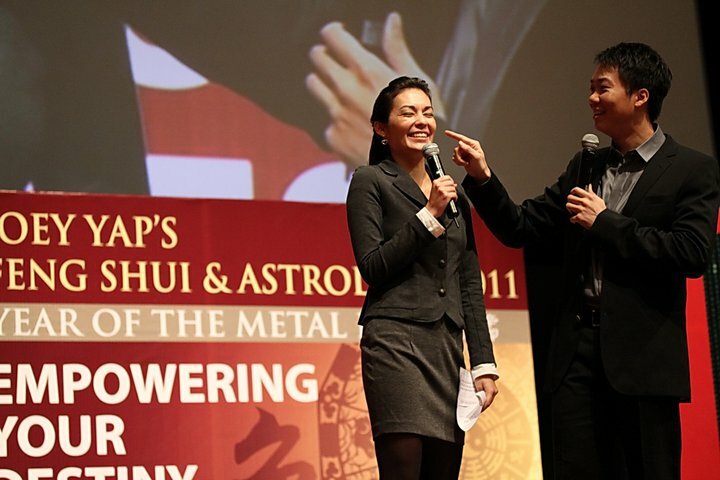 He even had a celebrity in the form of Stephanie Chai as emcee or host for the seminar! Besides talking about feng shui, Joey also touched on the art of face reading which somehow made his talk all the more interesting! Below is a photo of Stephanie Chai getting a "face reading" from Joey. Before attending the seminar, I had on the night before printed out my personal Bazi Profiling Chart. This is very important if you wish to attend his talk as you would need to look at your Bazi Chart to get the most out of his seminar. To know your Bazi Chart, you have to provide your date of birth and time of birth. The time of birth is crucial as a person who is born on the same day as you but at a different time will not have the same Bazi Chart as you. So what happens if one's time of birth is not accurately recorded? Sorry to say that such a person will not be able to know his or her exact Bazi Chart and therefore will have difficulty using feng shui to solve his or her problems. To help you understand better, Bazi also known as Chinese Astrology is akin to diagnosis whereas feng shui is akin to prescription. With your Bazi Chart, you know exactly what are your strengths and weaknesses and you can then use feng shui to enhance your strengths and lessen your weaknesses. From the Chart, you can see your Day Master (box in green). In the example above, Mr ABC's Day Master is Gui (Yin Water). There are altogether 10 different Day Masters or basic personality profiles. Your Day Master is basically who you are. It tells about your inborn personality, character, strengths and weaknesses. The Structure is your behavior and attitude in other words, how you use your personality. The structure reveals your natural behavior in life. There are altogether 5 different structures - you can be a Controller, Creator, Supporter, Thinker or Connector. Each of the Ten Day Masters express themselves differently through the five different structures. From the image above, you can see that Mr ABC is primarily a Thinker. The Profile reveals your unique abilities and skills, the masks that you consciously and unconsciously "put on" as you approach and navigate the world. Your Profile speaks of your ROLES in life. There are altogether TEN roles or Ten Bazi Profiles. Everyone plays a different role. From the image above, Mr ABC's profile is the Philosopher. Now how does knowing about your Day Master, your Structure and your Profile help you? Well, by knowing your strengths and weaknesses, by identifying the talents you never knew you have, by being aware of your character and personality, you can then assess your situation and design a path of least resistance to your success and a better future. By knowing your potential and your limits, you will know what type of career most likely to lead you to success and what type of person you will enjoy a successful relationship and marriage. You will no longer have to waste time doing things that are not likely to give you the results you are looking for. In other words, this will help you to find the "shortest way" to your goals! If you are interested to know more, you can attend Joey Yap's Design Your Destiny Seminar. Click HERE for more info. The price of course does not come cheap. Or for a much cheaper price, you can order a detailed report on your Bazi Profile HERE. Or you can just get his 3 books about Day Master, Structure and Profile respectively. But since there are 10 different Day Masters, 5 different Structures and 10 different Profiles (in other words, altogether 25 books to choose from!) you just got to know what is your Day Master, your Structure and your Profile in order to buy the right books! In Part 2 I will share with you Joey Yap's outlook for 2011, the good and bad sectors in your home and a set of important dates and times to activate your wealth, romance and nobility luck! So stay tuned! I attended his talk in 2007. He's great and I hv few of his books. Former UM chancellor Prof Diraja Ungku Omar once said in TV, "I don't believe in Feng Shui because I am a Muslim." Anyway, I wish you a Happy CNY. You send something to me for 2nd time before? Very long meh? Haha :D I thought all your posts are this looooooooooooooooooooooooooooooong? So by far you have had lots of upper hand in your life after applying all those feng shui "laws" that you have learnt? Wow...must print Bazi Profiling then only can attend this course? That essential? Sounds quite true for me. Cold sweat lah bro..can you pls type slowly for part 2 so Bananaz can slow slow read cant catch up yet as Lilian Too's still not digested..
Just curious is Master Yap Cheng Hai who was present during Lilian's presentation related related to Joey Yap? Heard its father and son connexion or grandpa? Have a Blessed New Year, Foong PC! You writing on this makes me so interested to learn more about feng shui. Hi, I am suscribed to your blog and I love Your new feng shui articles. I like feng shui, I learn a lot of you, I only know Lillian just now. wenn, so do you practise feng shui too? khengsiong, I have to admit it can be a bit complicating for beginners but I have tried to make it easy to understand as much as possible. I do not agree with what Former UM chancellor Prof Diraja Ungku Omar said because many Muslims are in fact, practising feng shui. And feng shui is non religious and you do not have to believe in it for it to work. ghosty nana, yes I did! You did not receive it?! anonymous, thanks for subscribing to my blog! I think it's better you learn about flying stars from Lillian or Joey's books cos it'll be quite impossible for me to explain it in detail here. Seriously, I argued with my daughter and husband everyday since 20 Feb 2011 after I have activated the 4 directions as advised by Joey Yap. They are SE1, N2, S2 and NE1 between 3.00pm and 5.00pm.